The globalization of individual companies and capital markets over the last two decades or so has transformed the business landscape. Most of the business firms have expanded operations overseas and those who haven’t, are facing competition from abroad. This is where a right HR strategy needs to be implemented to respond to this global competition. A good HR strategy will help in improving the productivity and effectiveness of any business. 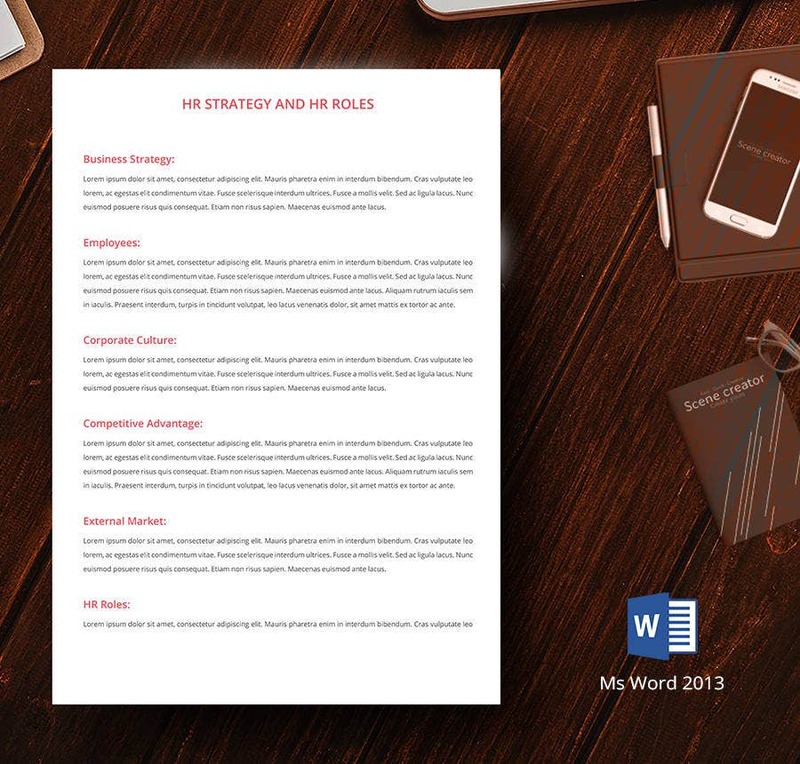 Our ready-made HR Strategy template will relieve you from drafting the whole thing from the scratch. You can make further customizations as per your organization’s requirement. Human resources play a vital role in attaining a business’s mission. So, if the sales and marketing departments present management with a strategy to meet a goal, they do it in the form of a sales strategy. 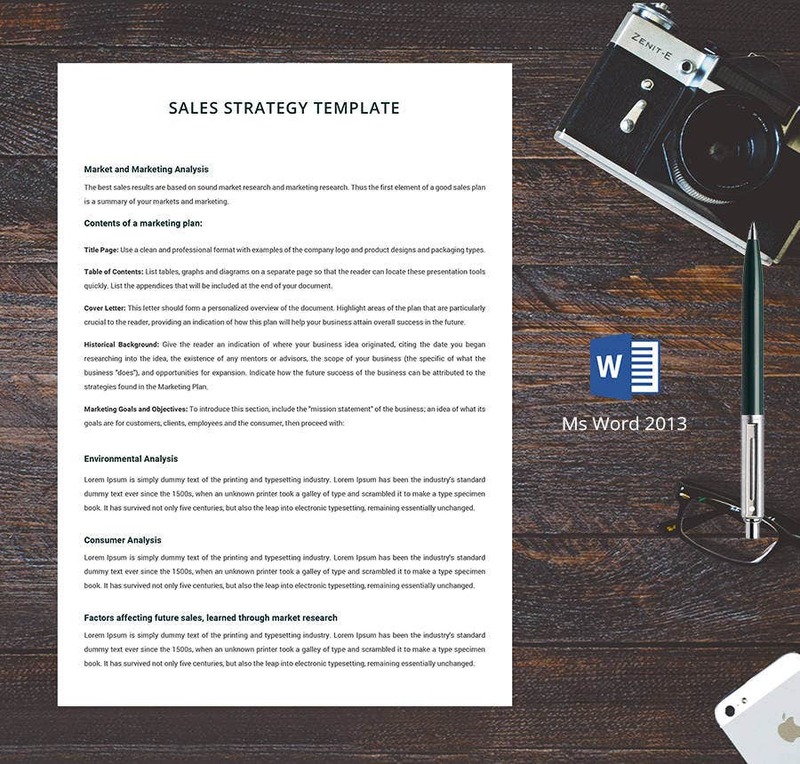 Our Sales Strategy Template is a predesigned word document which will help you in preparing business presentations and sales strategy proposals in a much quicker time. This HR Management Plan template enables you to develop a human resources management plan for a project. 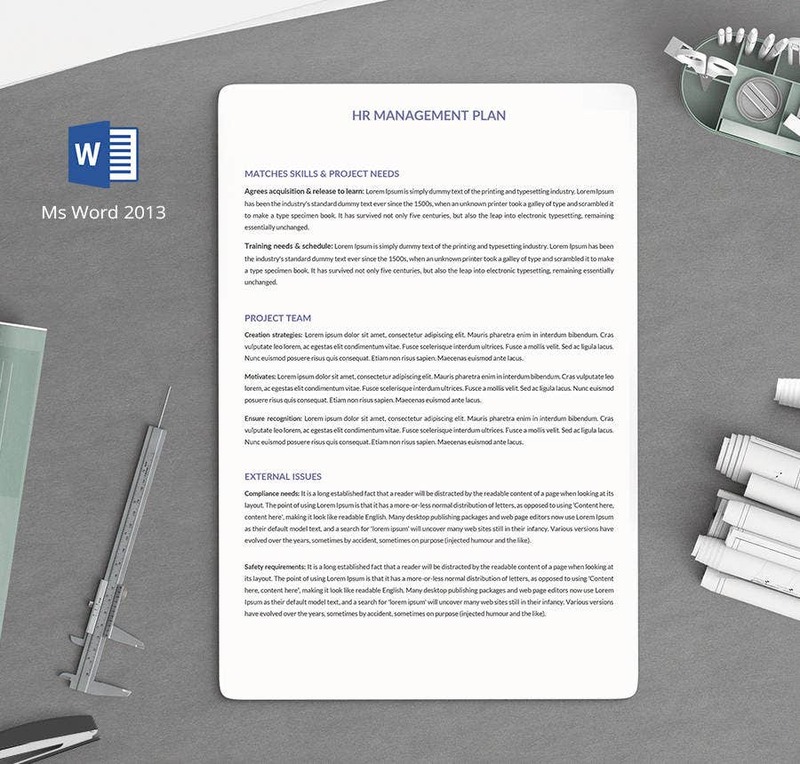 This HR Management Plan template is designed in such a manner that you will be able to customize it in ways that best fit your company’s rule book and corporate standing. Strengthening the employer-employee relationship is the strategic role that the HR plays in any organization. The HR managers formulate workforce strategy and determine the functional processes necessary to meet the organizational goals. Also, creating a work environment that is free from unnecessary hazards is a strategic role that the HR managers play. Strategic Human Resources Planning is a process that identifies current and future human resources needs for an organization to achieve its goals. Human resources planning serves as a link between human resources management and the overall strategic plan of an organization. 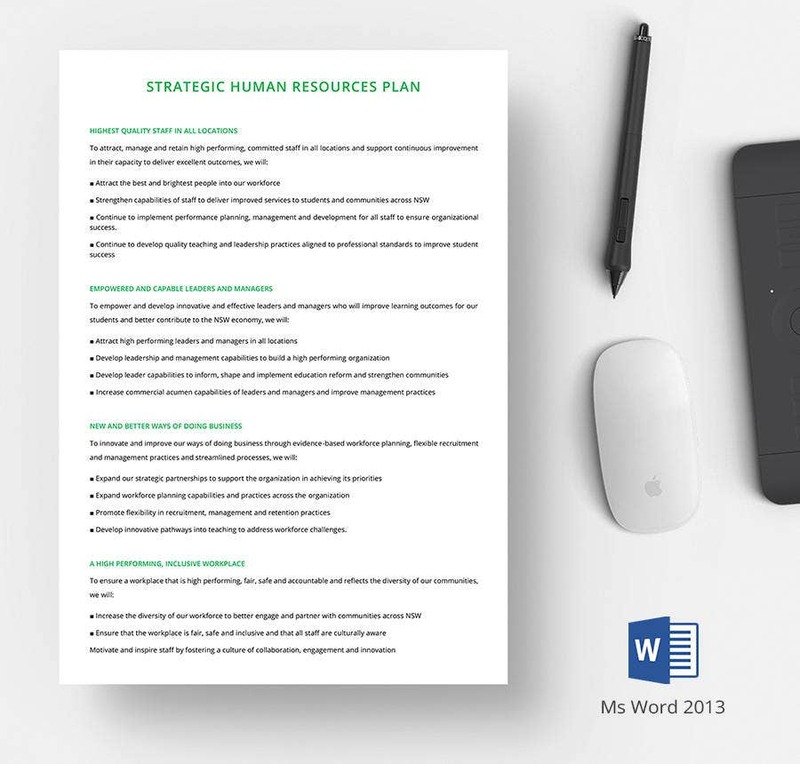 You can use our Strategic Human Resources Plan template which will significantly lower the time and effort required as it will provide you a structure that will make your job of creating HR strategies a lot easier. HR Career Development Plan helps HR in increasing employee’s motivation level which leads to enhanced productivity. HR Career Development Plans also include creating programs and activities such as job rotation, cross-training, mentoring, internship, coaching, etc that help in skill development of the employees. 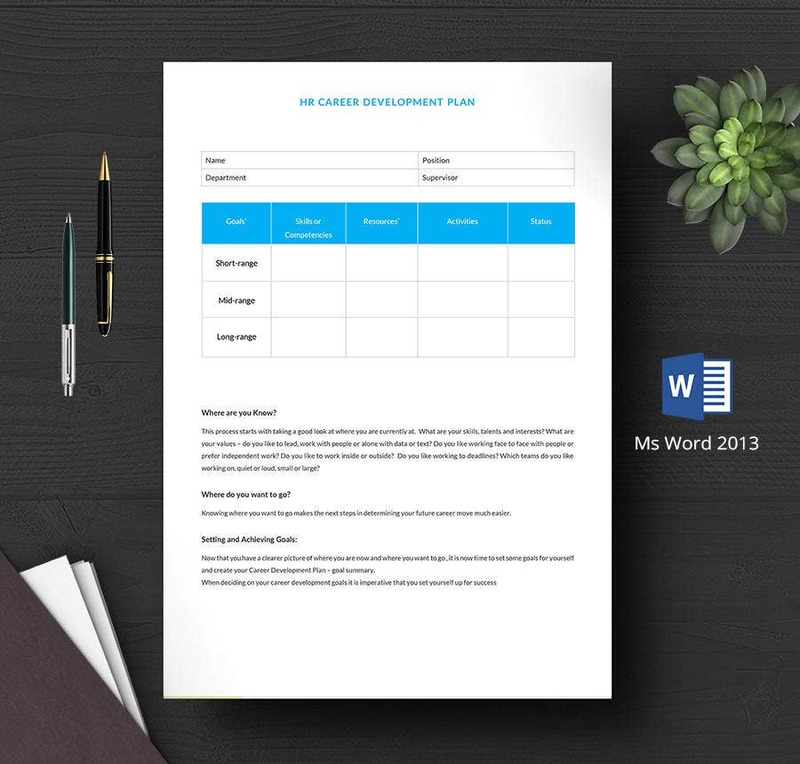 Our HR Career Development Plan is customizable through MS Word. So you can bring in further modifications as per your company’s requirement and create the best HR Career Development Plan for your organization. A properly built HR Strategic Plan helps the HR department in providing a positive human resources service experience for applicants and employees. It also helps in collaborating with other departments to recruit, develop, support, and retain diverse and talented employees who play a vital role in the company’s reputation and success. 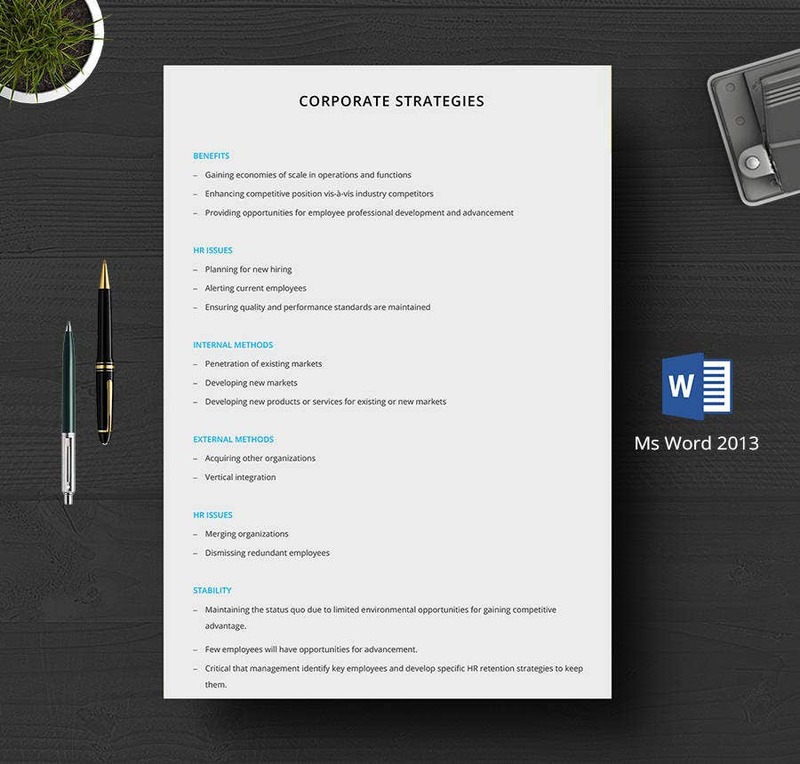 After making sure of the proposed business plan, the HR department uses corporate strategies to assess the business needs and calculate the staffs required. They are also used to take care of the policies and procedures the HR team has to follow during the entire recruitment process. HR Strategy helps in determining the company’s competitive advantage and most importantly, it helps in identifying key processes and key people. HR Strategy helps to foster a sense of team spirit and camaraderie within the organization. HR Strategy helps organizations in harnessing human potential and channeling it in the right direction – towards the attainment of the organization’s goal. A strategic HR department enables, empowers, and engages employees for the purposes of the business or organization. A well-planned HR strategy represents a framework for improved coordination and control of activities in an organization. HR Strategy allows more effective allocation of time and resources to identified opportunities. With a proper HR strategy or strategic HR plan, a company can plan how to move ahead with HR development and recruitment. They also help in linking the HR management with the central strategic plans of the company. 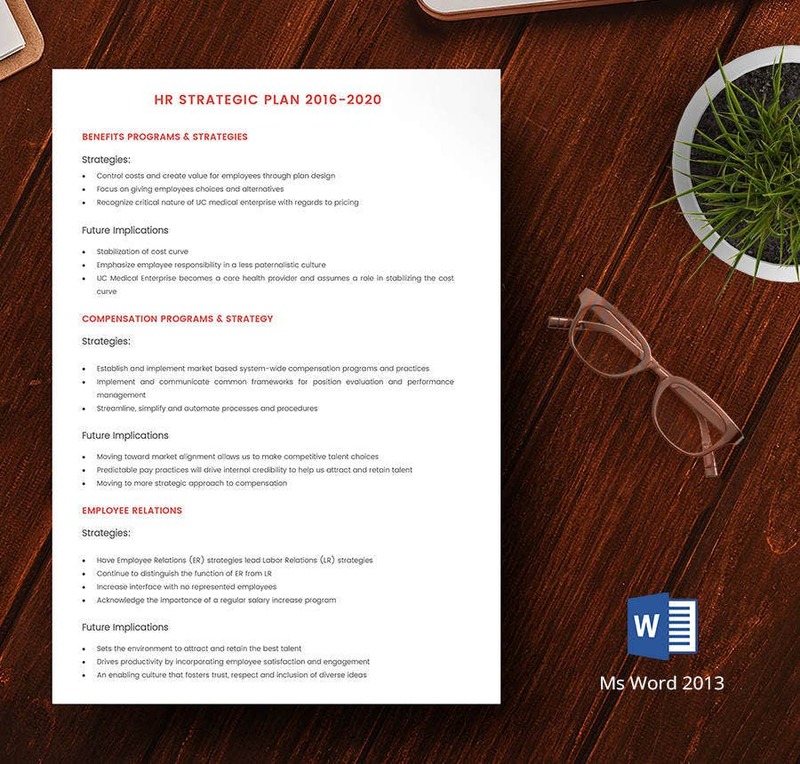 Hopefully, the above-mentioned HR Strategy templates will help you in chalking out the best HR strategy plans for your company which will be beneficial for the employees and the organization as a whole.